The organization of this day is left to the organizers that are the Associations, Guilds International, shops, forums or social networks. This day is above all the pleasure to meet, to exchange, to network and build solidarity in the sharing of know-how traditional or contemporary, with a refreshing drink or a festive meal. The spirit of the World Day of Patchwork is to know also how this activity brings together passionate (s) showing the same desire to rally around a common passion in the best state of mind. 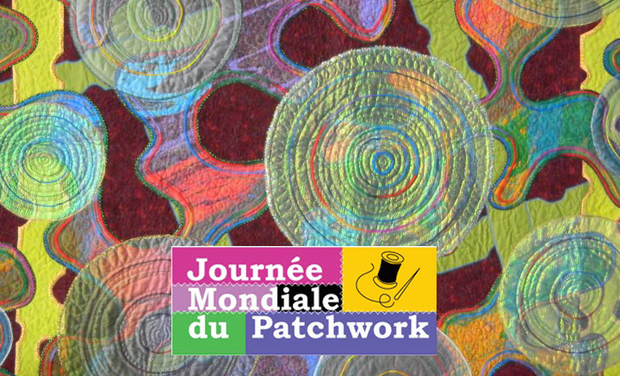 Tout est fait pour que la Journée Mondiale du Patchwork soit, grâce à vous tous, une réussite internationale. Ce site est notre lien, consultez le souvent des informations nouvelles vous y attendent. Passionnée de patchwork depuis 7 ans et ne connaissant rien en couture, j'ai découvert cette activité lors d'un salon où j'ai rencontré de talentueuses quilteuses qui m'ont donné le goût des tissus. Depuis je découvre régulièrement en surfant sur la toile des talents fous et des passionnés. Je suis devenue une boulimique des tissus : j'aime les toucher, les assembler, les broder et les mélanger à d'autres matières....et Internet est un moyen de communication idéal pour apprendre, découvrir, s'informer et échanger avec d'autres quilteuses de tous pays. J'ai également une passion pour toutes les nouvelles technologies. Mes différentes expériences : organisation d'événementiels, communication et information sur Internet. Passionate Patchwork for 7 years and knowing nothing in sewing, I found this activity at a show where I met the talented quilters who gave me the taste tissue. Since I discovered regularly surfing the web of talent and crazy fans. I became a bulimic tissue: I like to touch them together, the embroidery and mixed with other materials .... and the Internet is an ideal means of communication to learn, discover, learn and interact with other quilters from all countries. I also have a passion for all new technologies. My experiences: organizing events, communication and information on the Internet.